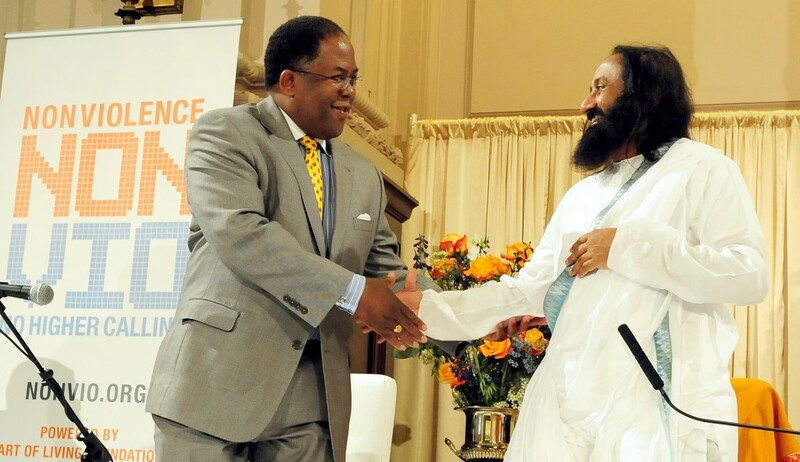 Chairman Mark Ridley-Thomas and Sri Sri Ravi Shankar. Everyday actions have consequences; Too many people are stressed out; Too many people live in poverty; Nonviolence is the most effective way to bring about change. This was the message that spiritual leader Sri Sri Ravi Shankar brought to an audience of nearly 900 people recently at the Art of Living Center in South Los Angeles. Shankar, who was joined on stage by Los Angeles County Board of Supervisors Chairman Mark Ridley-Thomas and several other speakers, has made it his mission to speak around the world about achieving peace. The Art of Living Foundation, which operates in more than 150 countries and was founded by Shankar, sponsored the Town Hall Forum as part of a series of events for the Nonviolence: No Higher Calling Movement. Similar forums will take place this month in San Diego, Chicago, Atlanta and New York. The movement calls on citizens and organizations to make commitments to nonviolence in their own lives and inspire it in others. The panel discussion addressed the role of nonviolent principles in government, public health and the media. Chairman Ridley-Thomas, who is devoted to the philosophy and principles of nonviolence practiced by Mohandas Gandhi and Dr. Martin Luther King, Jr., discussed how government can be used to address the root causes of violence and frustration in society by reducing poverty, addressing unemployment, improving access to health care, ending illiteracy and mass incarceration of young males and increasing education. The forum comes as Chairman Ridley-Thomas prepares to lead a candlelight vigil on April 4 to commemorate the anniversary of Dr. King’s death and to mark the end of the Season for Nonviolence, which began January 30—the day of Gandhi’s assassination. Chairman Ridley-Thomas said he strives as an elected official to affect change by nonviolent means, including his founding of the Empowerment Congress, his work with the Days of Dialogue and the educational, health related and criminal justice related policy he has championed.